Cosmo’s prides itself on having an eclectic menu, from seafood and steaks to pastas and paninis. Jack Baker, the corporate chef for Cosmo’s, says many of the menu items are inspired by his own childhood favorites. Baker credits his mother and grandmother’s Filipino heritage and his Southern upbringing for his cooking style. Traditional Filipino cuisine can range from simple fried fish to elaborate paellas and whole-roasted pig. These traditions combined with the heartiness of Southern cuisine makes Baker’s skills in the kitchen diverse and unique. 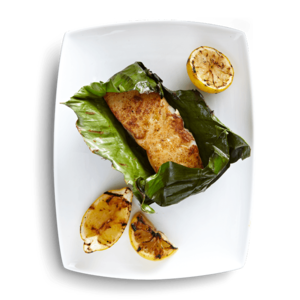 Even with such variety, the sea bass wrapped in banana leaves has emerged as a standout dish. The sea bass is prepped using the French cooking technique of wrapping it in parchment paper along with the banana leaves. This ensures that the steam is trapped and the fish retains moisture. Before being wrapped in banana leaves, the fish is rubbed with blended herbs and seasonings. Baked until it’s light and flaky, the fish is then paired with rice and vegetables.